School District 145, Freeport, Illinois Cannot Be Trusted – District Says Vote on March 18 for a 1% Sales Tax Increase and Your Property Taxes Will Go Down – Believe It and I have Winning Lottery Ticket to Sell You! Freeport School District 145 is spearheading an effort to add an additional 1% to the sales tax to benefit schools in Stephenson County. Freeport’s District, being the largest, would benefit the most from the additional tax. If passed, the additional tax would raise the Freeport rate to 9.25%. Statements by officials of this District carry no legal weight. Reduce your property taxes one year and double them next year – that is the bureaucratic way. 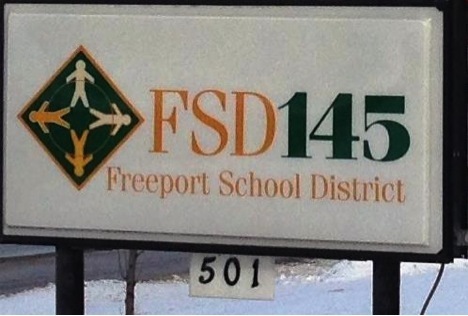 The superintendent and her assistants will move on to their next victim after the Freeport School District has been irreparably harmed. 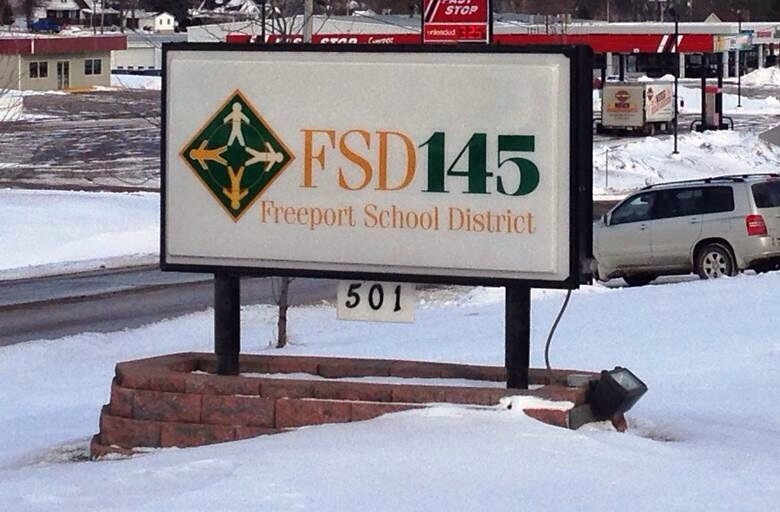 Freeport is a failing district, and more money is not the answer. Let’s spend more time educating the children of this District (not figuring out how to avoid making up “cold” days), and worry less about how you can raise more money from the already overtaxed citizens of this community. 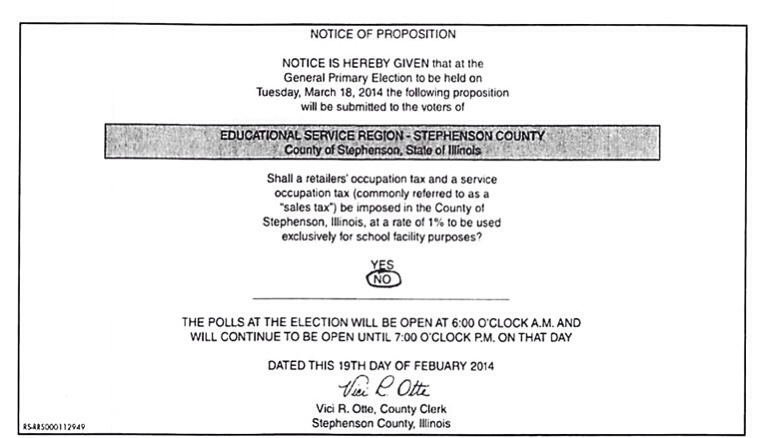 This entry was posted in City of Freeport, Politics and tagged district 145, failing schools, illinois schools, property tax, Sales tax on March 10, 2014 by Good Day Illinois. The Good and the Bad – People, organizations, governmental agencies, and taxing bodies which deserve special recognition. This Month the Bad – Freeport (Illinois) School District 145! Freeport School District Has A Lot in Common With The Politicians in Springfield – The Solution to Every Problem Is More Taxes! Real Estate Taxes in the City of Freeport are some of the highest in the country with the rate going up each year. Ask your local politicians about the rate for next year. The school districts in Stephenson County led by Freeport want another 1% added to the sales tax so Freeport will be 9%. Spend $10 and pay almost $1 in taxes! They say it will be used to pay off existing bonds. A sales tax increase is only justified if there is a corresponding decrease in real estate taxes dollar for dollar – and that must be guaranteed which is joke. Give the bureaucrats running the school districts more money, and they will just spend more money. Schools in the Freeport District received failing grades since not one grade met state averages, and has the lowest graduation rate of school districts in Stephenson, Carroll, and Jo Daviess Counties. So much for more money for failing schools. More money is not the answer. The Freeport School District has already announced it is increasing its levy 1.83% and that an owner of $100,000 residence will pay an additional $120 more in real estate taxes! 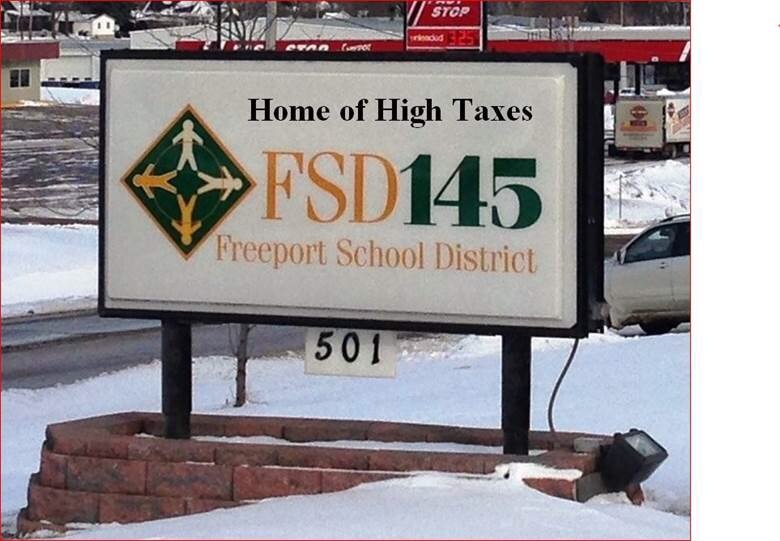 Yes, Freeport School District is recognized this month for consistently raising our real estate taxes and now it wants a special sales tax to raise even more money. Perhaps, it will request a special exit tax on everyone leaving the community until no one remains! True bureaucrats don’t care as long as they get paid – since they can just move on to their next victim when a community is destroyed. This entry was posted in City of Freeport, Politics and tagged freeport school district, real estate taxes, Sales tax, tax and spend on February 4, 2014 by Good Day Illinois. Florida Sales Tax Holiday for School Supplies and Clothes! While Florida has a sales tax holiday this weekend where you pay no sales tax on school supplies and clothes, Illinois politicians are busy thinking of new ways to tax the citizens of this state. When will they learn? High taxes are not the answer. This entry was posted in Uncategorized and tagged Sales tax on August 3, 2013 by Good Day Illinois.